Two miles into Florida Bay from Islamorada lies the boundary to Everglades National Park. 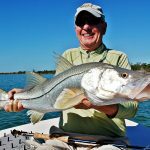 The term “backcountry” generally refers to any fishing done on the bay side and within the limits of Everglades National Park. This 1.5 million acre expanse of wilderness is home to an incredible variety of bird and marine life. To fish in the “park” is to take a step back in time. It is a special thing to have the opportunity to fish in a place miles away from any signs of civilization. It is a land of water, sky and mangroves. This spectacular backdrop also plays host to some incredible fishing as well. Just about every species that swims in these waters can be found “out back”. Bonefish, permit, tarpon, redfish, snook, sea trout, jack crevalle, ladyfish, snapper, sharks and Spanish mackerel can all be found in the park. The style of fishing here varies here as well. 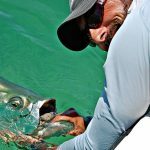 It can range from poling in inches of water searching for tailing redfish, to working mangrove shorelines for snook, to casting to laid up tarpon or drifting deeper grass flats for sea trout. 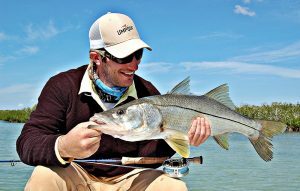 The fishing opportunities are simply endless.